Pam Ann Marketing is subcontracted by a local inbound marketing agency to provide SEO consulting and services for a client of theirs in the HVAC commercial services space. The engagement began in October 2014, and is still ongoing as of 2017. The first phase of the project focused on assisting the agency in architecting a website redesign to ensure that the new site would be as SEO-friendly as possible. Pam Ann Marketing provided a technical “blueprint” to ensure that the new site was coded as search-engine-friendly as possible, as well as in-depth keyword research and keyword optimization guidelines for the new site’s page content. That work culminated in July 2015, when the redesigned and newly-optimized version of the website was launched. Ongoing post-launch work for this project consists primarily of advising the inbound agency on keyword optimization of each piece of new content for the website, including 8 blog articles per month, as well as landing pages for downloadable content assets. Additional ongoing services include technical SEO consulting, analytics data integrity monitoring, reporting and analysis, and local SEO citation management. This powerful collaboration between Pam Ann Marketing and the highly-competent inbound marketing agency has resulted in exponential year-over-year growth in organic traffic for this client, as shown in the chart below. The first year post-redesign brought a 1,820% year-over-year growth in organic traffic. The second year post-redesign more than doubled traffic again. 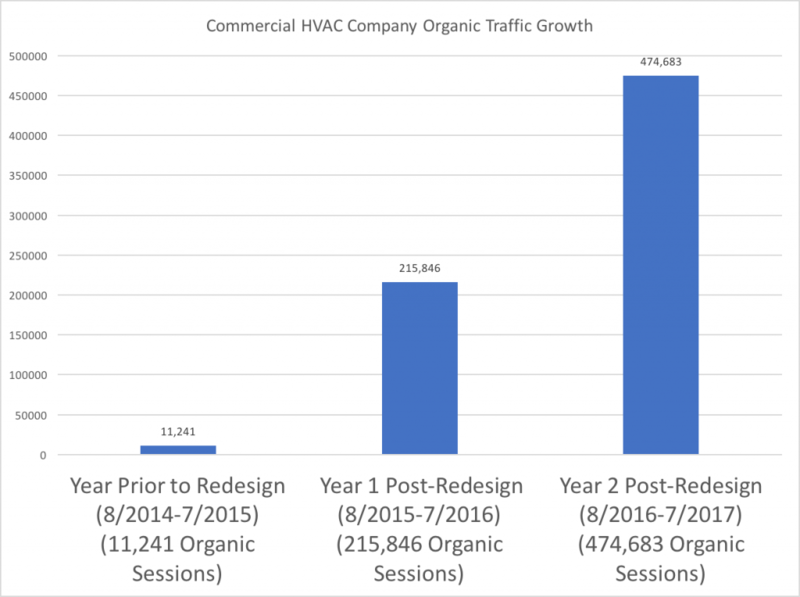 Year two’s total organic traffic represents a 4,123% increase over the year prior to the optimized redesign. This case study demonstrates how Pam Ann Marketing’s unmatched SEO expertise can greatly enhance any digital agency’s content marketing or web design offerings. We help ensure that new websites are coded with the highest level of search-engine-friendliness, and contain the best possible modern keyword optimization tactics to draw in the right target audience, bringing clients exponentially more traffic to their website than they would otherwise receive without such an in-depth SEO-focused approach. Visit our new sister company site, StealthSearchAndAnalytics.com, to learn how we can integrate our SEO expertise into your digital agency and bring these types of results to your clients! Not Happy with Your SEO Company? If you’re considering replacing your current SEO company, we would be happy to perform an objective SEO audit of your site so that you can see if you’re making the right decision. Click to read more about our white-hat SEO services. We also specialize in PPC and social media advertising, and can help advise which of these tactics might make sense for you. Get Cleared for Take Off! Contact us today to discuss your unique internet marketing needs. If you are located in northern New Jersey, an in-person consultation can be arranged. Is Your Web Developer Spoofing Your PageSpeed Insights Score?